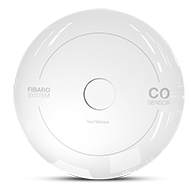 FIBARO CO Sensor is a HomeKit-enabled carbon monoxide detector using Bluetooth® low energy wireless technology. Its high sensitivity allows to detect the presence of the carbon monoxide (CO) gas at the early stage in order to prevent carbon monoxide poisoning. Alarm is signalled with a built-in siren, blinking LED indicator and by sending information to your iOS device. 1. 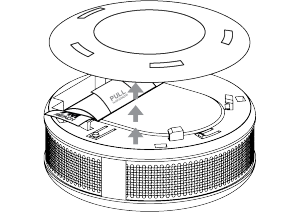 Open the casing by turning the cover counter-clockwise. 2. Take off the cover. 3. Remove the battery blocker and check if the battery is placed correctly. 4. Proper powering up will be confirmed with a short beep. 5. Open the FIBARO for HomeKit app and tap + icon. Application will guide you through the pairing process. 7. Attach the device to its cover. 8. Turn the device clockwise to close it. 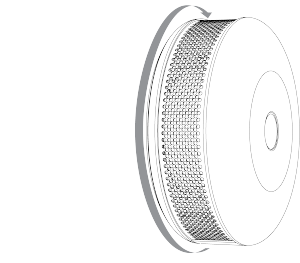 Install the device on the wall, at least 30 cm (1 ft) away from the corner. Recommended height of installation is dependant on the purpose of the room and height at which head typically is. Release the button when LED indicator glows white. Click the button when LED indicator glows yellow. After few seconds the device will be reset (confirmed by red LED indicator). Caution! The alarm is very loud! Only the first alarm sequence is quieter. The LED indicator will glow white and you will hear a short beep - keep holding the button. Release the button when you hear the first alarm sequence. Move away from the device to protect your hearing. The CO Sensor alarms about abnormal levels of carbon monoxide concentration with 4 red blinks and 4 loud beeps (every 5 seconds). Alarm is also reported to your iOS device. The CO Sensor measures carbon monoxide concentration and reports. If measured value differs from previously reported by at least 5ppm, accessory reports it to your iOS device. Last 2500 measurements are stored in non-volatile memory of the accessory and can be accessed via FIBARO for HomeKit app. The CO Sensor measures ambient temperature every 30 seconds. If the measured temperature differs from previously reported by at least 0.5°C (0.9°F), accessory reports it to your iOS device. 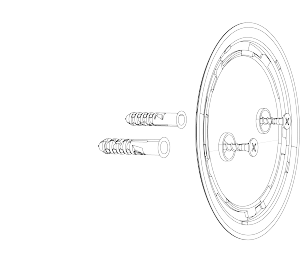 The CO Sensor detects tampering when accessory is removed from its base and reports it to your iOS device. Tampering is indicated withone white blink and beep. The CO Sensor measures battery level every 6 hours and reports it to your iOS device. Additionally, if battery level is below 15%, the accessory will report low level battery status to your iOS device and indicate it with one yellow blink and beep. To control this HomeKit-enabled accessory, iOS 9.3 or later is recommended. Controlling this HomeKit-enabled accessory automatically and away from home requires an Apple TV with tvOS 9.2 or later or an iPad with iOS 9.3 or later set up as a home hub. 2. Move to fresh air! Replace the device before date on the frontor if sensor error is detected. All information, including, but not limited to, information regarding the features, functionality, and/or other product specification are subject to change without notice. Fibaro reserves all rights to revise or update its products, software, or documentation without any obligation to notify any individual or entity. Fibaro and Fibar Group logo are trademarks of Fibar Group S.A. The Bluetooth word mark and logos are registered trademarks owned by Bluetooth SIG, Inc. and any use of such marks by Fibar Group S.A. is under license. All other brands and product names referred to herein are trademarks of their respective holders. 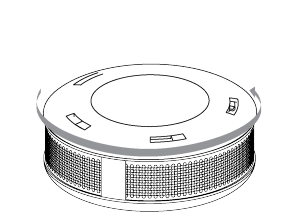 Device labelled with this symbol should not be disposed with other household wastes. It shall be handed over to the applicable collection point for the recycling of waste electrical and electronic equipment. Hereby, Fibar Group S.A. declares that FIBARO CO Sensor is in compliance with the essential requirements and other relevant provisions of Directive 2014/53/EU. The included Panasonic CR123A battery contains 1,2-Dimethoxyethane substance. Normal use of the device does not expose the user to a given substance. 1. What is the FIBARO CO Sensor? FIBARO CO Sensor is an ultra-light, compact, battery-powered carbon monoxide detector, designed to be placed on a wall. Its high sensitivity allows to detect the presence of the carbon monoxide (CO) gas at the early stage in order to prevent carbon monoxide poisoning. Carbon monoxide (CO) is a colourless, odourless, and tasteless poison gas that can be fatal when inhaled. It is produced when liquid, solid, or gas fuel is burned. 3. What are symptoms of carbon monoxide poisoning? The early symptoms of carbon monoxide poisoning can be confused with flu-like symptoms: headache, dizziness and nausea. Breathing carbon monoxide causes these symptoms even in healthy people. It can also cause sleepiness, vision problems (including blurred vision), ringing in the ears, aching arms and legs, irregular breathing, fatigue and confusion. At very high levels, it causes loss of consciousness and death. 4. Is it possible to power the accessory using the external power supply? Unfortunately not. The device can be only battery-powered. 5. Why I cannot pair my accessory? a) Make sure your accessory is powered on. b) Make sure your accessory is close to your mobile device. c) Make sure you use a correct setup code. d) If you own more than one identical accessory, use the ‘Identify’ function. e) You may need to reset the accessory if it’s not connecting, or if it’s already connected to another home. 6. Why my accessory is not shown on pairing screen? c) If you just connected your accessory, wait a moment, then try again. d) You may need to reset the accessory if it’s not connecting, or if it’s already connected to another home. 7. I have just reset my accessory, but it is still visible in the app. Why? 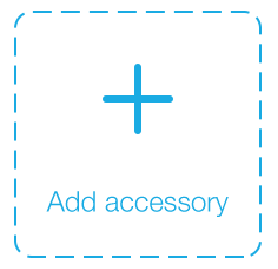 The accessory needs to be removed manually using the application interface. 8. I removed my accessory manually using the application interface, but cannot pair it again. Why? 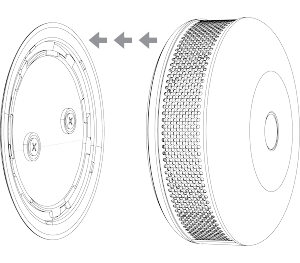 It is necessary to perform the reset procedure of the accessory according to its manual. 9. The accessory was paired successfully, but it doesn’t report the status correctly. Why? a) The accessory is out of range. Come closer with your mobile device and try again. b) The battery is empty and needs replacing. 10. My battery is low, how to replace it? Take off the cover, remove the empty battery, insert a new one (keeping right polarity), and close the cover. 11. Can I use the CO Sensor as a stand-alone device (without being a part of smart home system)? FIBARO CO Sensor may operate both as a stand-alone carbon monoxide detector and in cooperation with HomeKit technology as a part of smart home system. 12. Can I install the CO Sensor on the celling? 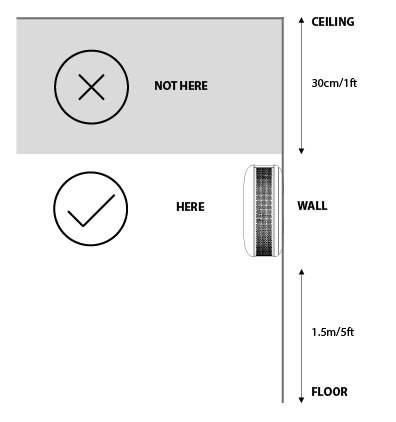 The accessory should be installed on the wall, below the ceiling level and at least 30 cm (1 ft) away from the corners. Remember that recommended height of installation is dependant on the purpose of the room and height at which head typically is. 13. Can I mount the sensor outside? The device designed for indoor use only. 14. Does the CO Sensor have an expiration date? Yes. Expiration date is located on sticker on the front of the device. Replace the device before given date or if sensor error is detected. 15. How to arm or disarm the CO Sensor? FIBARO CO Sensor is always armed and ready to detect carbon monoxide. 16. The chart has been yellow for a few hours and despite that my alarm turned on. Why is that? Long-term presence in the room with the lower concentration of CO can be as poisonous and harmful for your health as CO in high dosage. In the case of such situation, follow the messages displayed on your phone. Accessories are HomeKit-enabled products that have an official "Works with Apple HomeKit" badge on their packaging. These accessories are certified by Apple under its MFi Program. Every HomeKit-enabled product should have a "Works with Apple HomeKit" badge on its packaging.